Clint Eastwood stars as bigoted Korean War veteran in movie "Gran Torino"
LOS ANGELES, California (CNN) -- Clint Eastwood doesn't know if he's a legend. 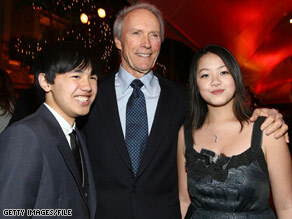 Clint Eastwood attends the "Gran Torino" premiere this month with actors Bee Vang, left, and Ahney Her. "Maybe, what is it?" he asks, before making a reference to a line from director John Ford's "The Man Who Shot Liberty Valance," "When the legend becomes fact, print the legend." But for more than 50 years, he's appeared on the screen and behind the camera. His film credits include "Dirty Harry," "Every Which Way But Loose" and the three "Man With No Name" Westerns. He owns four Oscars -- two for direction of "Unforgiven" and "Million Dollar Baby" and best picture wins for those two films -- and he's been nominated for six others. His most recent contribution to the film world is "Gran Torino." In the film, which Eastwood also directed, he stars as Walt Kowalski, a Korean War veteran who is forced by immigrant neighbors to challenge his prejudices. Kowalski is a recognizable type, the gruff, sometimes bigoted old man who may be hiding more heart than he lets on. Even though he's not too caring at the start, "he ends up expressing love to a family he's never known before," Eastwood said. CNN: When you read the script, were you at all concerned about the nature of the language? Clint Eastwood: No, I wasn't. If you're going to learn something and progress in the movie as a character, you have to start as something else in order to learn tolerance. And your character obviously is never too old to learn that, so he has to be a certain way. But I -- being politically incorrect -- I find [it] fascinating because I hate the so-called PC thing. I think that's one of the things that's damaging our generation at the present time. Everybody is taking themselves and everything so seriously. If they just relax a little more and take themselves and everything else a little less seriously, they'd have a lot more fun. CNN: I understand Nick [Schenk] was the original screenplay writer. Boy, did he get a grand slam, getting Clint Eastwood to sign onto his project. Eastwood: Well, it was interesting because he had a hard time getting it to us for some reason. Anyway, they did and finally they got it to Rob Lorenz, who's my associate. And he read it and said, "Well, it's kind of interesting. You might find this character interesting." He says, "He's got a lot of -- he's kind of a racist -- he's a little bit of a lot of things." I said, "Well, it sounds interesting, I'll read it." You know, he said the same thing you're saying. He said, "It's not exactly politically correct." I said, "Perfect. Let me read it. I'll read it tonight." CNN: It's great that after doing so many films in your long career, you're still looking for that edgy material. The material that's not quite in the box obviously. And I heard that you don't know if you'll be doing too much acting anymore? Eastwood: I don't think so. I just don't think there's going to be that many good roles, or as you say, edgy material. CNN: Maybe not edgy material for the typical senior that's an actor, but you're a legend. You're Clint Eastwood. So I'm thinking people are writing stuff for you. Eastwood: I'll tell you why. It's that I do enjoy being behind the camera. I started directing 38 years ago in order to be involved in the whole project and not just the one component of acting. And so it became interesting to me to look at the whole picture. And so I'm enjoying it back there. And next picture I do, Morgan [Freeman]'s going to be upfront and I'm going to be behind the camera. And that's where, I think, where I belong. CNN: And you guys are shooting that film [about Nelson Mandela] in South Africa? CNN: You guys are buddies now. Eastwood: Well, this will be our third together film over the years. The other two films ["Unforgiven" and "Million Dollar Baby"] seem to be reasonably successful, so we just hope we can keep a trend. CNN: You've got "Changeling," and then you've got "Gran Torino." Both of them are getting a lot of buzz. What's your reaction to the fact that you'll probably be getting a lot of [award] nominations? Eastwood: Oh, I don't know about that. I don't think about that. I just make the pictures and where they fall is where they fall. If somebody likes them, that's always nice. And if they don't like them, then too bad. It's just you -- you just make this picture. Actually, I kind of make a film for myself to sort of express myself. Or it's a story I might want to follow. I never think too much about anybody seeing it. And then when you're done with it, you go, "Oh my God. Now we got to see if anybody wants to see this thing." So we're at that period right now, at least on "Gran Torino." CNN.com's Jacque Wilson contributed to this report.